Keelung is a prominent port city in Taiwan, situated on the northeast coast, just a 30 minute train ride from Taipei. You might think so what, a port city. 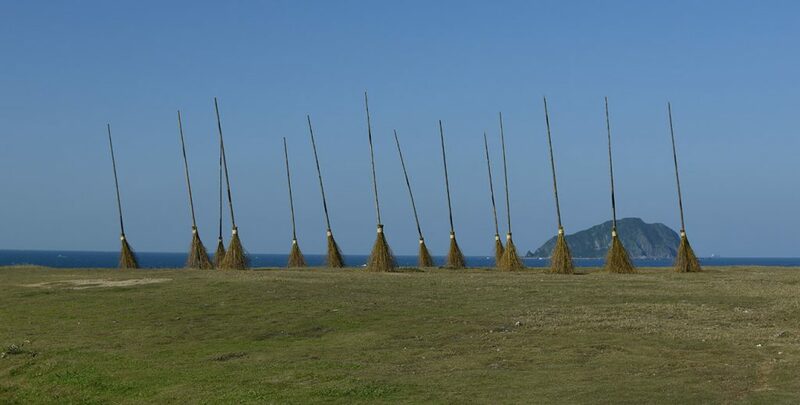 Well, Keelung has some really beautiful sights to offer and you shouldn’t miss them! 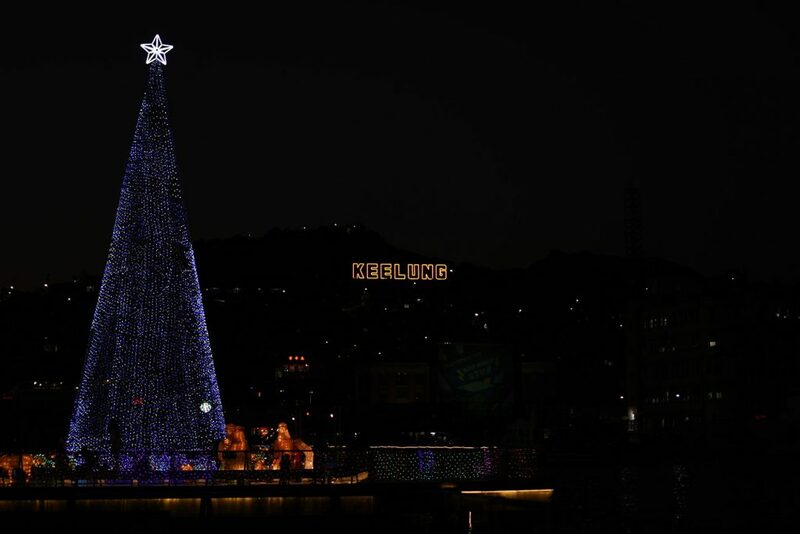 Since it’s so easy to reach from Taipei, Keelung is a great idea for a day trip. 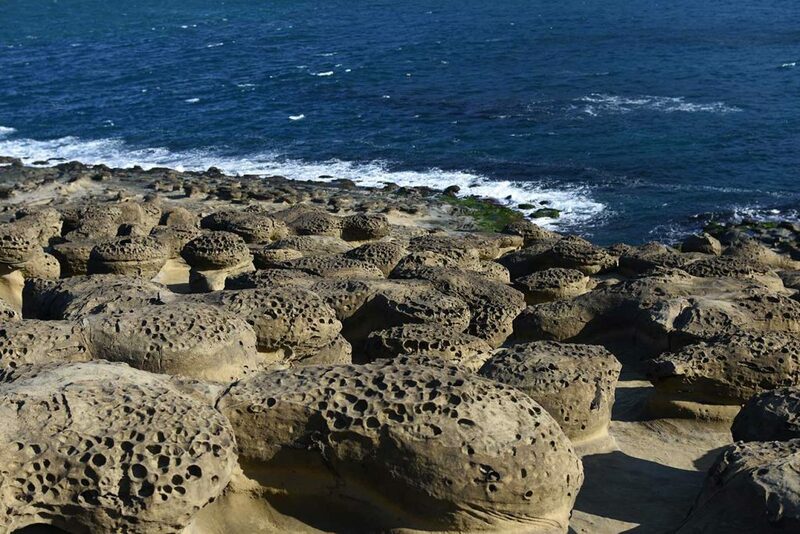 Leave the big city and you’ll soon gaze upon the big blue ocean and spectacular rock formations. If you’re looking for some more nature in your day trip, then check out our post on Taroko National Park, also a great day trip from Taipei. Our biggest tip for Keelung would be to hire a taxi driver who will take you to all of these locations. It doesn’t take all day and if you negotiate you could get an awesome deal. We didn’t hire a taxi, but rather went from stop to stop, some of it walking and some by taxi. However, walking took quite a while and really cut down on the time we had to sight see. It’s up to you! There is always traveling by bus or car, but if you’re like us, then you prefer the train! You will not be able to take Taiwan’s HSR (high speed rail), as that only runs on the west coast. Nevertheless, it’s still a short journey to your destination. From Taipei Main Station, you’ll find many trains going back and forth throughout the day. If making a day trip, we recommend getting started before noon. You can purchase your train tickets online at Taiwan’s TRA website or at Taipei Main Station. Now that you’ve arrived in Keelung, you have some options. Taxis are always a great source of transportation as they’re very cheap and we always had a great experience with drivers. There are buses that run throughout Keelung as well and there’s also walking! We did a great bit of walking during our Keelung trip but used a taxi at certain times. Our first stop was Badouzi Seaside Park. We didn’t really know what to expect for Badouzi Seaside Park. 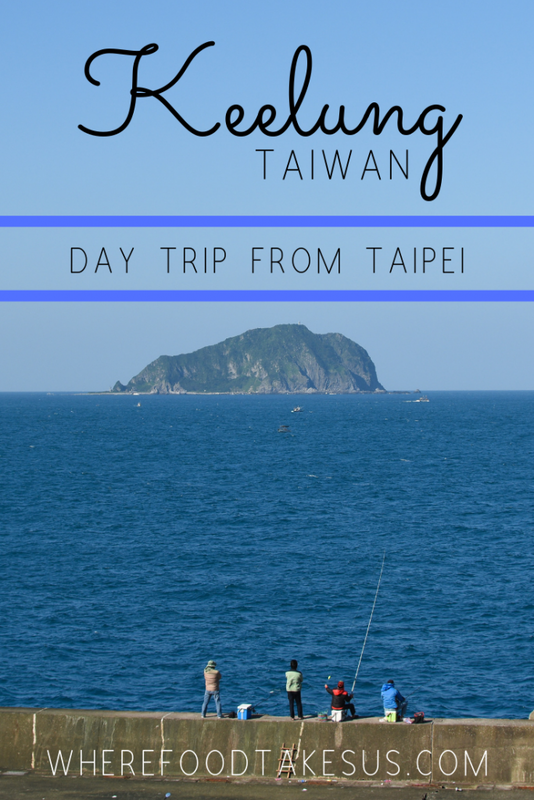 Unlike most of our travels in Taiwan, we hadn’t heard a lot about Keelung beforehand and just winged it. We knew that Keelung was rainy and a port city. That’s it. Well, we confirmed it was a port city but the rain decided to take the day off, making for perfect weather! Badouzi Seaside Park was a wonderful sight and a really good place to start our day. We had eaten soon before arriving so we weren’t hungry, but this would be an ideal spot for a picnic. 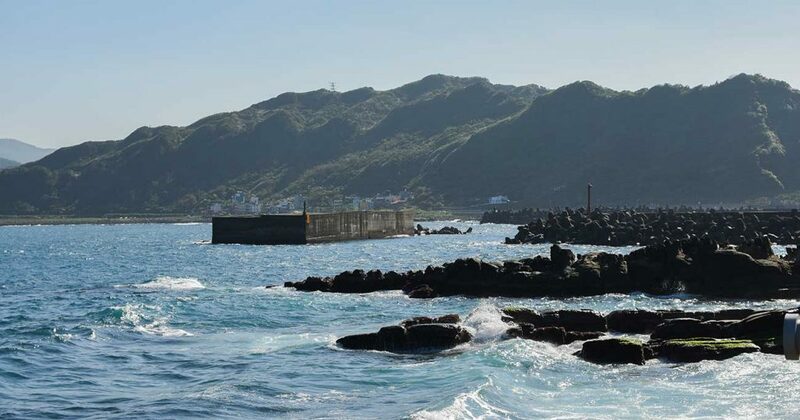 You can relax on one of the many benches or rocks, and gaze out at Taiwan’s northernmost island or look up at Keelung Mountain, all the while the blue waves are crashing against the mossy rocks below. 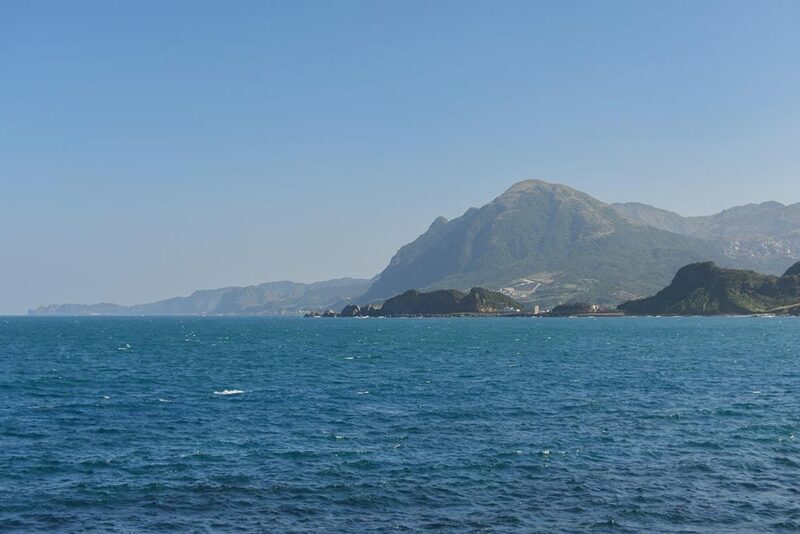 The fact that this kind of nature is less than an hour away from bustling Taipei amazes us. We walked here from the Badouzi Seaside Park. 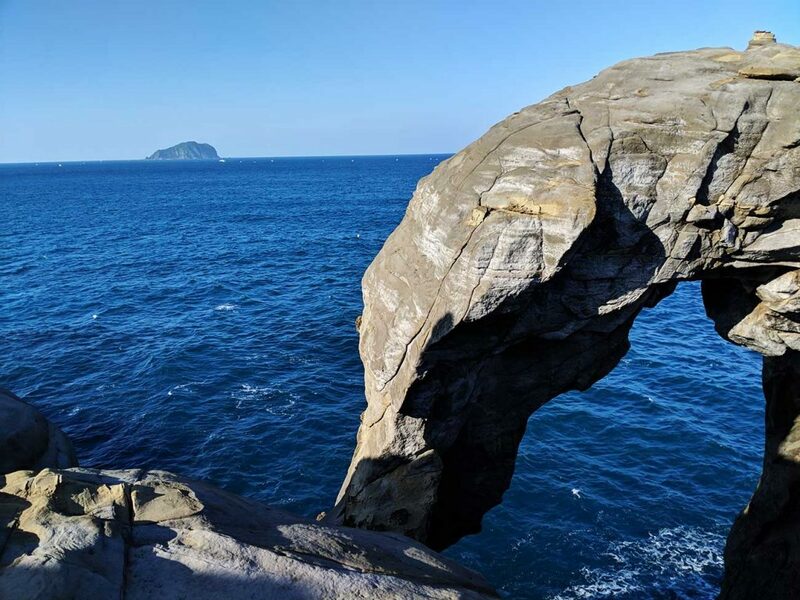 Technically, Shen’ao Elephant Trunk Rock is outside of Keelung limits and within New Taipei City, but we visited it on the same trip. The walk took about an hour. Sounds like a long time but it’s not bad since you have a beautiful view the entire way. 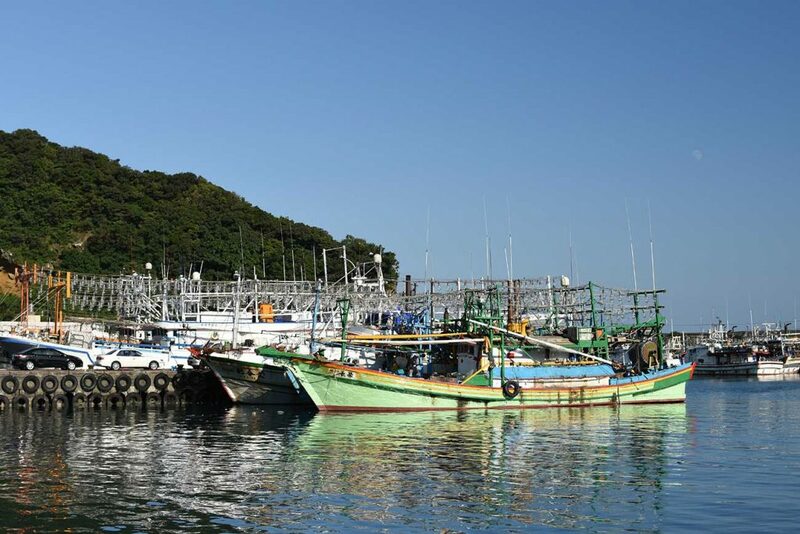 You eventually turn off the main road and pass by all the local fishing boats. It’s interesting to see the locals at work. One of the busiest spots of the day, Shen’ao Elephant Trunk Rock is worthy of all the traffic! It’s busy, but not so busy you can’t enjoy it. We were able to spread out among all the mushroom-like rocks and settle down for a nice snack. The elephant rock is definitely worth seeing and taking a picture but we rather enjoyed just walking among the awesome rock formations and watching the coast. There were many people around but we easily found a quiet spot to relax and eat. Our next adventures required a taxi. Still wandering further outside of Keelung, we used a handy dandy app called FindTaxi. This will be your friend, especially when outside of Taipei. From Elephant Trunk Rock, we headed to the Yin and Yang Sea. Or rather, an observation spot for the Yin and Yang Sea. The Yin and Yang sea is a colored patch of water where yellow and blue beautifully combine in the bay as a visual for the natural duality of Yin and Yang. For those that don’t know what Yin and Yang is, it’s a Chinese concept that says that everything has inseparable and contradictory opposites like male and female, light and dark, or old and young. The variation in color in the Yin and Yang Sea comes from the blue of the ocean and the yellow of the pyrite deposits. It is advised that you do not swim in this water. Just look! We don’t recommend viewing the Yin and Yang sea from sea level. You get a better view a bit up the mountain on the way to Jiufen Old Street by way of the Golden Waterfalls. Before you reach the Golden Waterfalls you will turn off the main road to find the Observation Deck. Your best bet here is to take a taxi as well. Use that FindTaxi app! 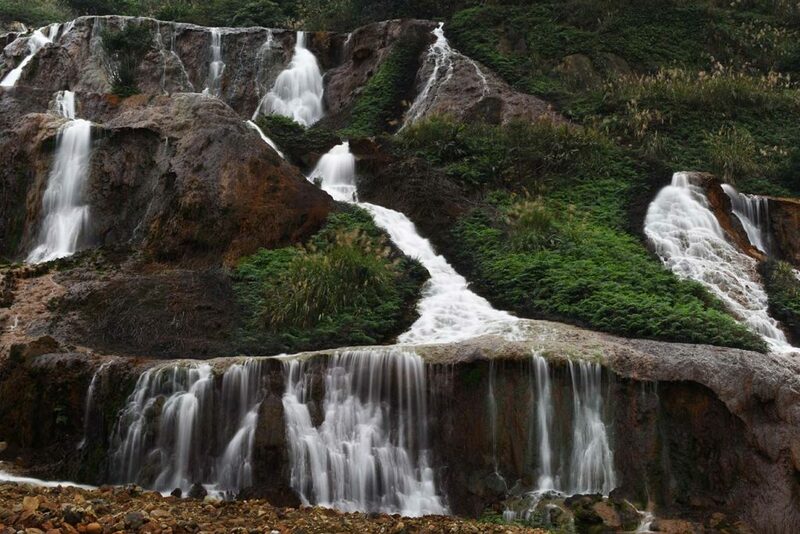 Golden Waterfall can be found further up the mountain from the observation deck of the Yin and Yang Sea. It’s a great place to stop and enjoy the sound of rushing waters and an impressive waterfall. We spent a good amount of time here before returning to Keelung. There weren’t many people there, giving us an ample opportunity to really enjoy it. Again, the FindTaxi app was a great resource. Instead of wasting a lot of daylight by walking, we got there in a hurry. 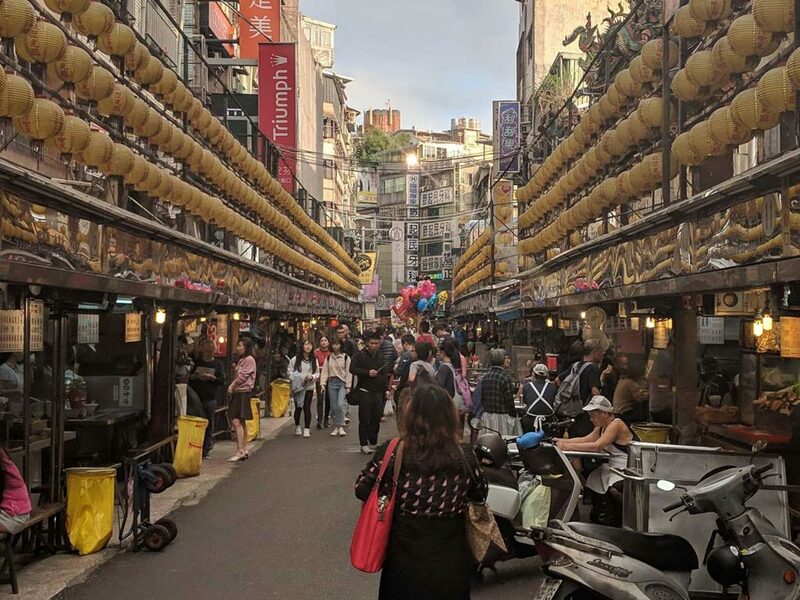 This is a very famous night market in Taiwan. Like most night markets, it’s huge. Unfortunately, time didn’t allow us to explore the whole market but it definitely seemed different than other markets in some ways. You had your usual food carts but a lot of the stands seemed more permanent than just a food cart and they had a few different options than the other markets we had been to like braised pork on rice and other braised pork dishes. There’s also a beautiful temple in the middle of the market. 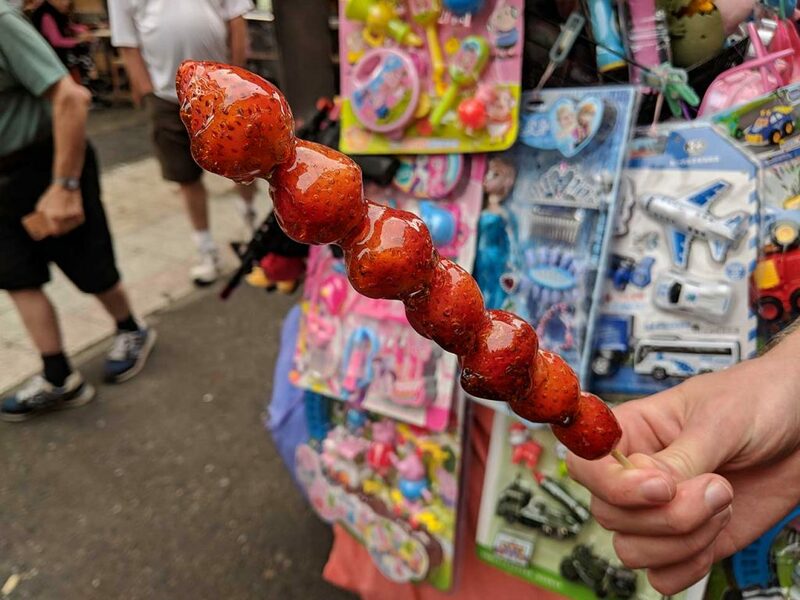 You can find these strawberries at every market and you need to try them. A thin hard candy shell gives way to a warm and soft center. Delicious! 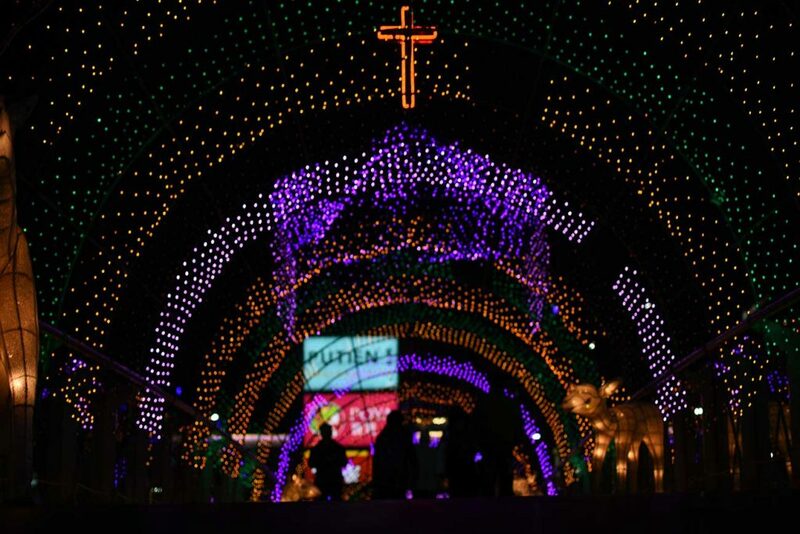 Going around Christmas, this area was lit up for the season. Even if it’s not Christmas, you should still go! It’s near the train station, only a few minutes walk. You can see many ships, including cruise ships and some from the Taiwanese Navy. 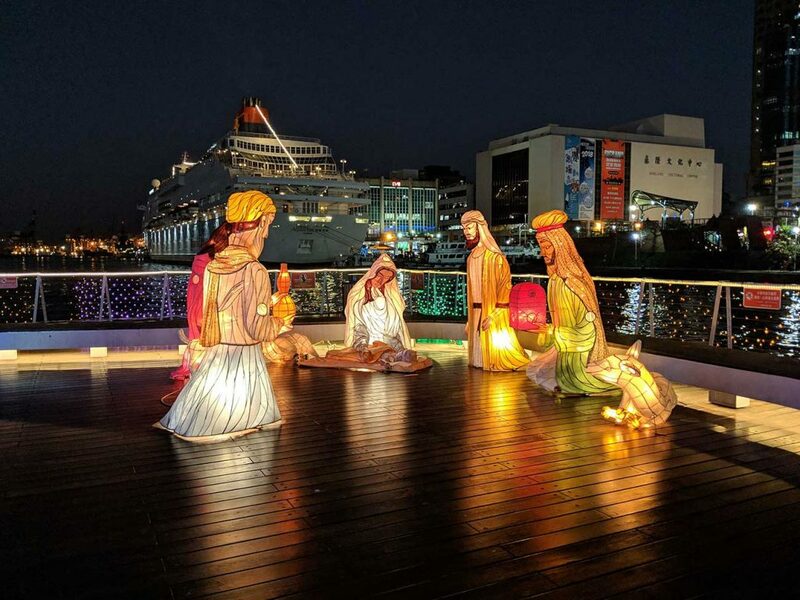 Keelung is a great place to visit on a day trip from Taipei. 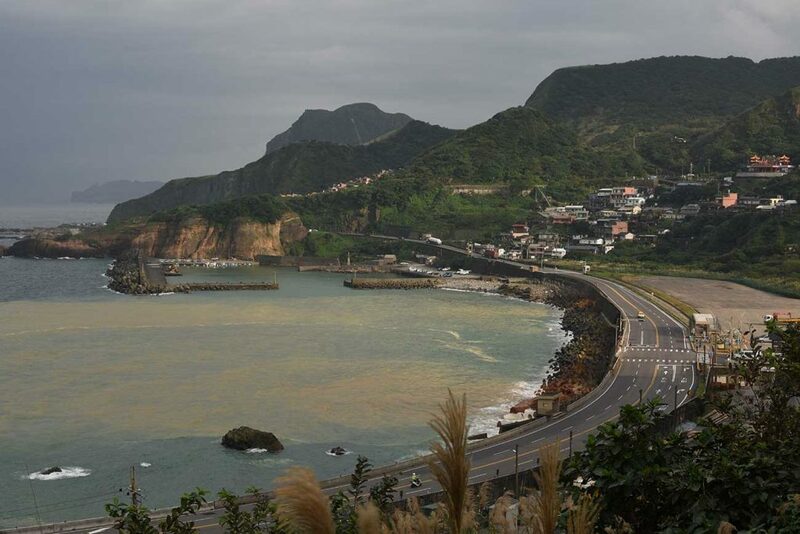 This area of Taiwan offers up beautiful landscape and waterscapes, as well as a great night market experience. 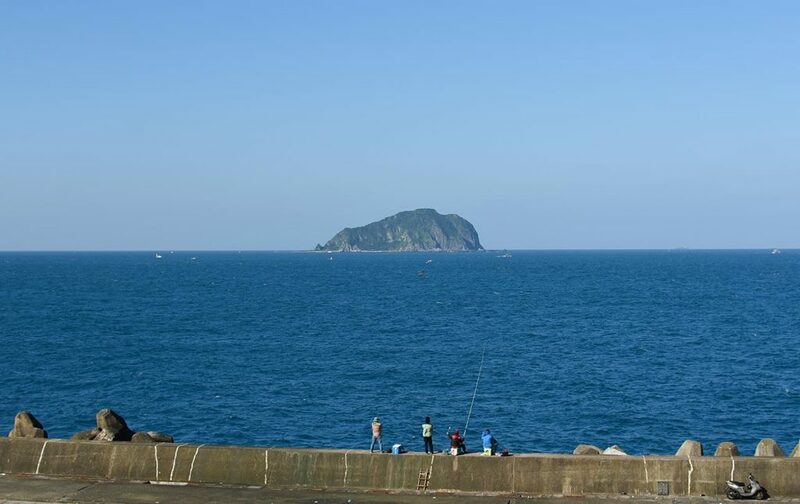 Full of friendly people, like all of Taiwan, Keelung makes for a memorable and fun visit to Taiwan’s coast.